Yeah, that's what I meant. Though, Cassini didn't have an atmosphere probe. Just fit some manner of propulsion on the probe, accelerate it early on in the mission so it arrives a few months prior. Though, Cassini didn't have an atmosphere probe. My point was that Galileo and Cassini both successfully deployed a secondary atmosphere-penetrating probe, and I was referencing them as precedents. Naturally the probe would have to different in design to both the Galileo Probe and Huygens. accelerate it early on in the mission so it arrives a few months prior. Alternately you could deploy it and then slow down the primary craft It would eliminate much of the propellent needs of the secondary probe. Ah, yeah, Huygens. Thought you meant one going into Saturn's atmosphere at first. 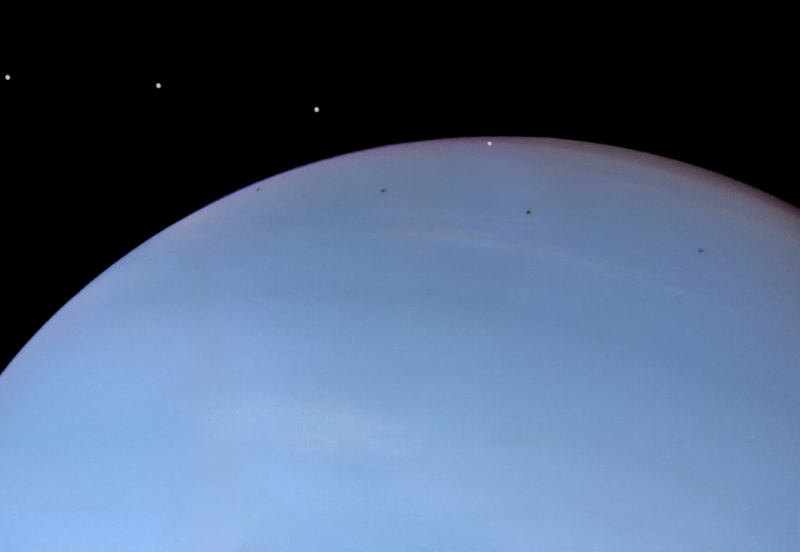 Hubble has discovered a new moon of Neptune! We need an orbital elements for this moon! According to the information, its orbital period is 23 hours and its orbit is circular. That by itself should be enough to calculate approximate orbital elements. 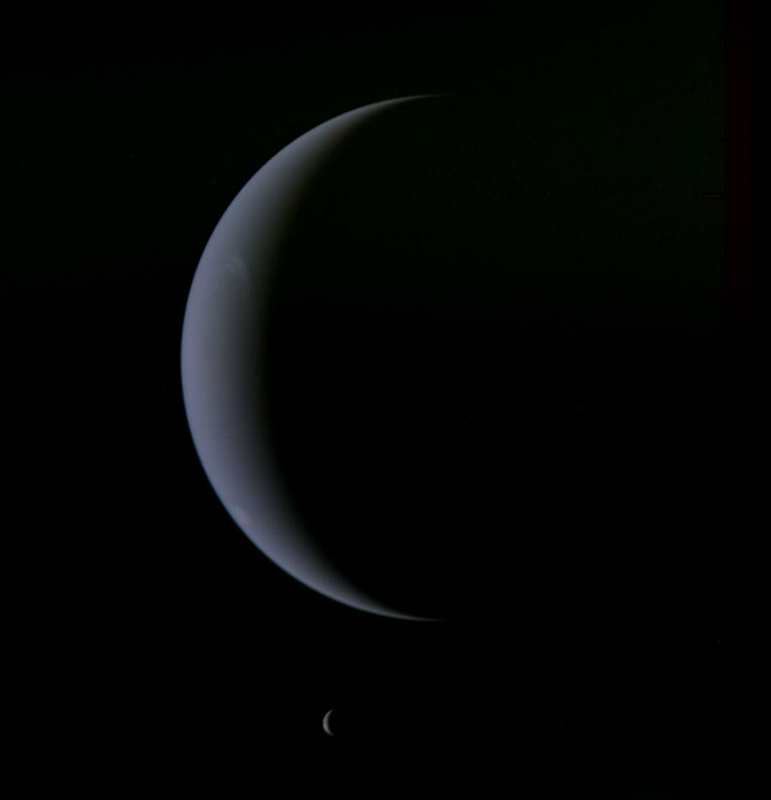 Its distance from Neptune is also listed as 65,400 miles, and it is between the orbits of Larissa and Proteus. 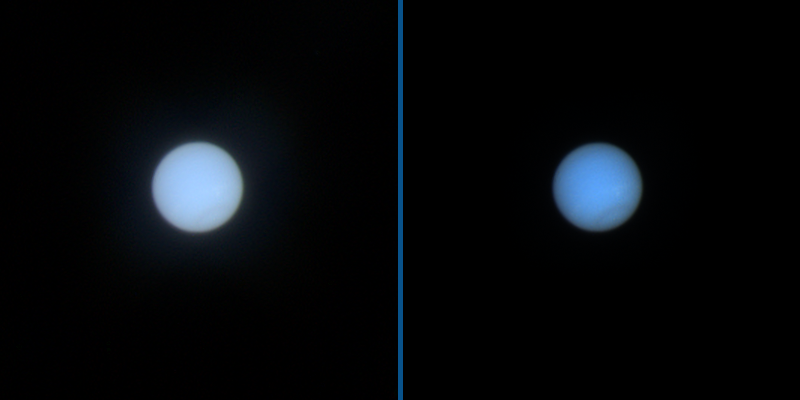 A composite image of Uranus, based on real images, by Phil Stooke. I saw Neptune just now! It took me over an hour, but I've finally seen every planet. The fact that I was looking through a tree and that it's only an hour away from setting really made it difficult. It's very, very faint, even in my telescope and even compared to Uranus - which I saw last year. It's got a clear blue shine to it, though. When I began I had some hope I might glimpse Triton too, but in the rather poor viewing conditions it was immediately obvious that wasn't going to happen. I found it thanks to the relatively bright and nearby 58 and σ aquarii, which form a quite striking pair, that together with a few fainter stars very close to them form a kind of hook. Once I recognised that mini-asterism from the star chart of the region I've got, I managed to get to Neptune by hopping from triangle to triangle of faint stars. 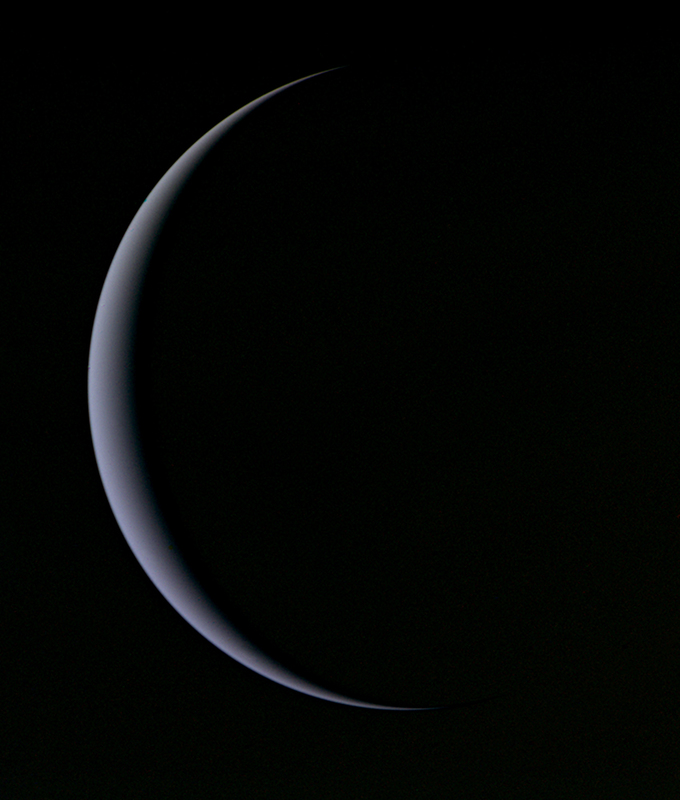 Triton is about as dim as Pluto, and would be extremely difficult to see I'd like to image Neptune, but given the part of the sky it's in I doubt I could find it with my camera It's the only planet I haven't seen yet, and Triton is the only major moon I haven't seen. I saw Neptune just now! It took me over an hour, but I've finally seen every planet. Congrats! Even though Neptune is just a tiny little disk through the telescope, I always thought there was something about it that was spellbinding. Maybe it's the color. Mercury was actually the last planet I ever got around to seeing. Pesky day star! Neptunian moon Neso have orbital period of 25.6 years! Its semimajor axis is 0.3 AU, reaching 0.48 AU at farthest point! That's wild. Amazing how extended the moon systems get in the outer solar system. That must have taken a looooong campaign of observation to be sure it wasn't just a passing asteroid in a similar orbit!